The Galapagos Islands are one of the last remaining places on Earth where schools of endangered scalloped hammerhead sharks can be seen, mostly around Darwin and Wolf Islands. But the animals are shy and mysterious; and if they are to survive, scientists will need to learn more about their lives and critical habitats in order to ensure their continued existence. Two new discoveries may help in that work. Until recently, only a very few hammerhead shark breeding areas had been detected in the Eastern Tropical Pacific. But less than a year ago, the first to be found in the Galapagos was discovered. And just weeks ago, it was announced that researchers may have found where the female hammerhead sharks that live near Darwin and Wolf Islands go to have their pups. 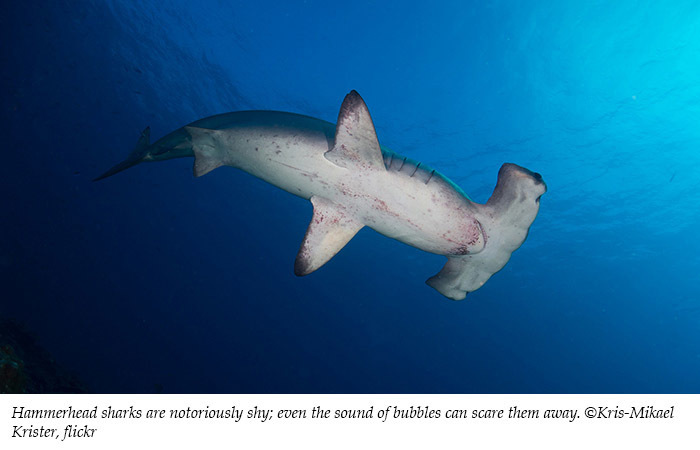 Since scalloped hammerheads are being increasingly targeted by commercial and illegal fisheries for their fins—which are highly valued for use in shark fin soup, popular in Asian markets—and because of their vulnerability to being caught as bycatch in gill nets, purse seines, trawls and by longlines, these discoveries may have come just in the nick of time. Found in temperate and tropical waters of the Atlantic, Indian and Pacific Oceans, the migratory scalloped hammerhead sharks differ from their close relatives by the “scalloped” front edge of their hammer-shaped head (which is called the cephalofoil). Biologists believe the cephalofoil evolved to improve a shark’s vision and to provide a larger area for the electroreceptors that the sharks rely on for hunting prey on or under the sediment. In December 2017, Ecuadoran scientists found a natural breeding site, or nursery, for scalloped hammerhead sharks along the coast of Santa Cruz Island. Here, in sheltered mangroves that are filled with crustaceans, the sharks breed and give birth to their pups—sometimes in litters of 30 or more—after a nine- to 10-month gestation period. The female sharks then leave their young in the protected, food-rich coves, where the juveniles can slowly mature to adulthood, safe from many of their natural predators (such as other sharks) in the open ocean. Researchers are now using tags (programmed to pop off after a set amount of time) to further study the sharks. Since scalloped hammerheads can live as long as 30 years, the tagging project has the potential to provide decades of data on their lives, such as where they go and what they eat—information that previously has been scant. While we now know the location of at least one scalloped hammerhead shark nursery in the Galapagos Islands, scientists have been struggling with another hammerhead shark mystery, and this one concerns migration: where are the females that live around Darwin and Wolf Islands—which have some of the world’s highest concentrations of sharks—going to have their pups? Now, thanks to tracking data from some tagged sharks, we have some of the first evidence showing that pregnant hammerheads from those islands may be migrating to mainland South American countries, such as Ecuador, to give birth. While the researchers say they knew the sharks were migrating to the mainland, the new tag data could help determine if they’re doing so specifically to give birth. DNA paternity tests conducted with adult sharks in the Galapagos and pups found in nurseries around the islands and coastal mainland regions will be used to help answer that question. Sharks not only keep marine prey species in check, creating a more balanced ecosystem, they also benefit coastal economies. For example, in the Bahamas, sharks generated $114 million in 2014; and 2016, sharks in Florida generated $221 million for the state’s economy. From activities such as diving and tourism in Palau, a shark may be worth more than $1 million throughout its lifetime. If it turns out that mainland areas are important nurseries, such as the island one near Santa Cruz, it may help the governments of South American nations better protect the sharks, especially from fishing dangers. 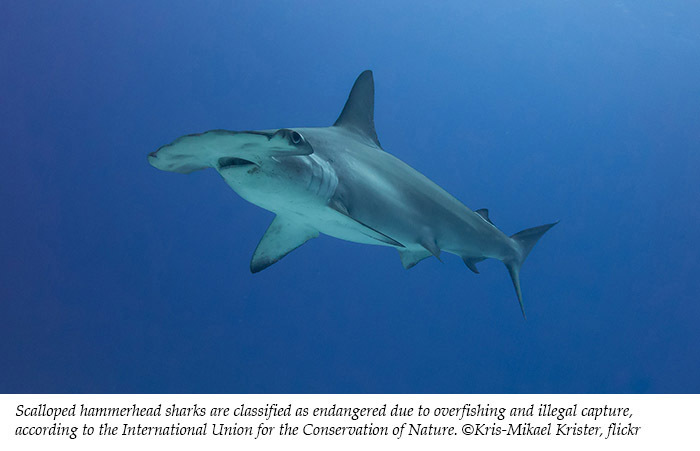 Rather than relying solely on regional marine protected areas, it may be imperative that international marine protection agreements are instituted before the endangered scalloped hammerhead sharks and other threatened shark species edge closer toward extinction. The discovery of the natural breeding site of this unique species of sharks is a very important event, now that the organisms in charge of the protection and care of the biodiversity of the Galápagos Archipelago, such as the Charles Darwin Foundation, convince the authorities to exercise strict control of this area to prevent fishermen from trying to prey on them.